HID stands for Human Interface Device. This is a term used to describe certain types of computer peripheral, usually connected via USB or more recently, Bluetooth. Windows, MacOS, IOS, Android and Linux support a number of "native" HID devices using in-built drivers. The way in which the U-HID and BlueHID boards emulate natively-supported devices means they require no special drivers or host software, with the exception of LED output control. 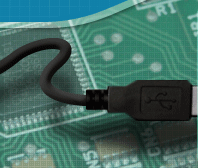 The boards have up to 50 connections which can be configured to any of these HID device types providing a truly universal interface. 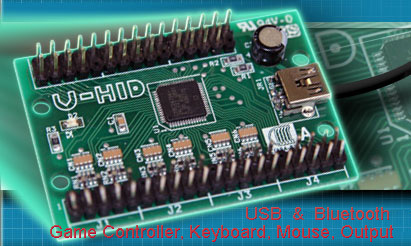 For example, you can connect pushbuttons to generate keyboard keystrokes, trackballs to act as a mouse, pedals to act as analog game controller joysticks, or hundreds of other device types. The PC, Mac, tablet or phone will see all the devices as something it recognises, so all standard applications will work. The menu headings on the left give more details of each type of device.